Der Goony Max is an inspired bit of lunacy from Excelsior Rocketry, and I guess depending on where you stand on the Goony issue, this series is either genius or a waste of a good Baby Bertha. Speaking as the one-time-owner of an original Goonybird Cloudhopper, I happen to fall on the genius side of the ledger, and to be honest, I can't imagine anyone would fall anywhere else. 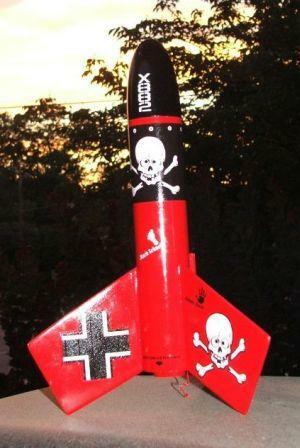 Der Goony Max is a Baby Bertha-based knock off of Estes legendary pre-political correctness rocket, Der Red Max. Chances are very good that today's litigious climate will keep Estes from ever reissuing Der Red Max, but Excelsior has made it possible to keep the spirit alive with the Goony Max decal set. The instructions for the Baby Bertha are as standard as it gets in the non-RTF world of model rocketry. The only change in the Goony Max conversion is to substitute a standard set of Der Red Max fins in place of the Bertha fins. From that point on it's just a matter of paint and decals, neither of which should cause even the least experienced flier to break a sweat. The only mods I made were to glue a 36" of Kevlar shock cord into the top centering ring, swap the stock shock cord out for a longer piece of 1/4" sewing elastic, and attach a 2" x 2" piece of perma wadding. Add a snap swivel to the stock chute and you're ready to fly. Finishing can be as simple or complicated as you like. I went the standard route using thinned Elmer's Fill 'n' Finish to kill off the tube spirals and balsa grain, then painted the body of the rocket gloss red and the nose cone gloss black. The decals make this project. After spraying them with a coat of protective clear, they were very durable and easy to apply. First flight of the original Goony Max was on a cold but sunny day that happened not to fall on the weekend of a regular club launch. 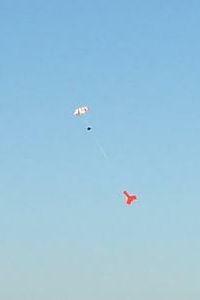 Chan Stevens and I spent the afternoon flying rockets that had not been previously flown for reviewing purposes. One of those I flew was the Goony Max. I was surprised at how high the rocket went on the B6-4, but I shouldn't have been. There is little extra weight in the Baby Bertha to begin with and even the Big Bertha is a decent small field flier on a B6-4. The Goony Max weathercocked some, but this only allowed it to recover closer to the pad. I threw caution to the wind for the second flight and went with a C6-5. The flight was almost identical to the first with light weathercocking but was noticeably higher. The recovery walk was a bit further as the Max apparently didn't catch a ride back on a lucky breeze. Still it was a very cool flight. The third flight came just before I was going to apply the decals. I had another rocket that I wanted to fly for a review, so I took the Goony Max along to B6-4 Field just to get it some airtime. Unfortunately it's still getting air. Flying on a B6-4, the Max launched in a spot of dead calm air. The flight was high and straight, but a breeze popped up just as the rocket neared apogee. The breeze grew stronger and was blowing the Max toward the school then died. 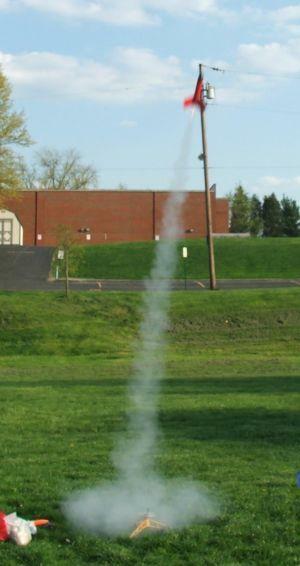 The rocket drifted down into the waiting arms of one of the rocket eating trees that ring the field. It was only a few feet off the ground, but the tree was on a hillside. This made what should have been a simple matter of reaching up and untangling the parachute completely out of the question. I had planned to return the next day with a long pole, but we got some rain that night so I just started with another of my stash of Baby Berthas. For several weeks the Goony Max just sat there looking more haggard with each passing day, but recently I've noticed that it was gone. Hopefully it has gone to a good home. PROs: Unique Goony design. Cool decals. Great performance from capability all the way up the engine scale. I hadn't put the decals on my first version before it got stuck in a tree. CONs: My first one got stuck in a tree before I could decal it.